Retail sales dropped 1.2% month-over-month in December, the largest drop since September 2009, according to data from the Census Bureau released Thursday. The dip was broadly unexpected – consensus estimates had foreseen a 0.1% increase in retail sales for the month, according to Bloomberg data. Excluding autos and gas, which can be volatile, core retail sales plunged 1.8%. 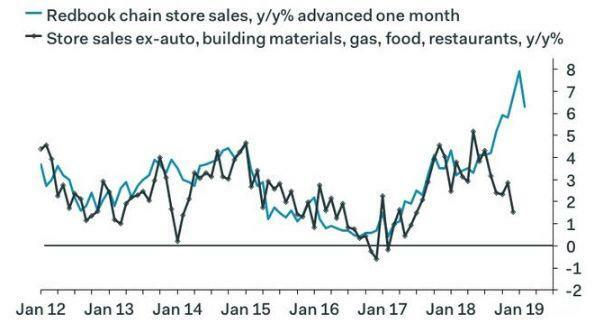 “[The] fall in retail sales in December was every bit as bad as it looks,” Capital Economics’ Michael Pearce said bluntly. The weakness was broad-based. Sporting goods stores sales fell 4.9%, miscellaneous store retailers fell 4.1%, non-store retailers — which includes online retailers — dropped 3.9%, department stores fell 3.3%, and health & personal care stores fell 2.0%. Economists said that the decline in the “official” Census Bureau figures is easily explained in the context of broader financial market volatility and uncertainty over a partial government shutdown, which saw about 800,000 federal employees either furloughed or working without pay. Both of these factors had also contributed to weaker readings for consumer sentiment, with a reading from January capturing the residual impact of December’s market performance and government shutdown registering at the lowest level since October 2016. Does the data lack credibility? The largest drop in headline retail sales was especially surprising given that previously released data from other institutions had suggested that retail sales had risen for the month. According to a Mastercard SpendingPulse study released at the end of December, the holiday shopping season had been the best in six years. A Johnson Redbook report, likewise, showed that December sales rose over last year, though the firm draws results from a smaller sample. The release of the Census Bureau’s retail sales figures – along with a host of other economic data – was delayed due to the government shutdown. The Census Bureau’s retail sales numbers “are astonishing, and impossible to square with the Redbook chainstore sales survey, which reported surging sales in December and a record high in the week of Christmas, on the back of the plunge in gasoline prices,” Ian Shepherdson of Pantheon Macroeconomics wrote in an email Thursday. Other economists echoed these sentiments. The decline in retail sales could portend slower growth in the impending print on fourth-quarter gross domestic product, said Michael Pearce, senior U.S. economist with Capital Economics. Household consumption, encapsulated both through retail sales and personal incoming and spending reports, comprise about 70% of the U.S. economy. A Morgan Stanley economist also noted the impact on their GDP forecasts. This doesn’t necessarily mean the economy is falling into a recession, however, especially amid recent strength in other areas including the labor market. But coupled with Thursday’s report of weaker-than-anticipated producer price data, “it strengthens the case for the Fed to remain ‘patient’ in the months ahead,” Pearce said.